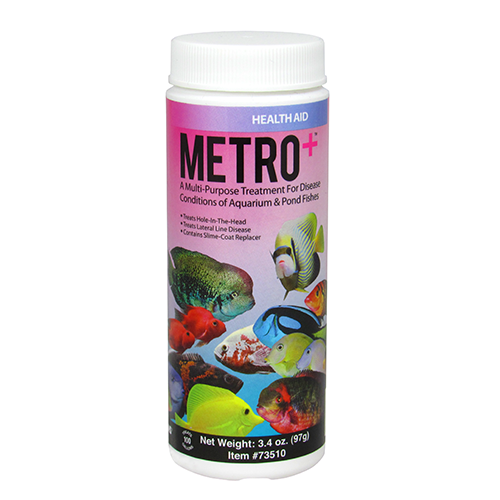 Metro+™ is a powdered formula that was developed to offer the hobbyist an effective way to treat lateral line and hole-in-the-head diseases suffered by their pond, freshwater or marine fishes. 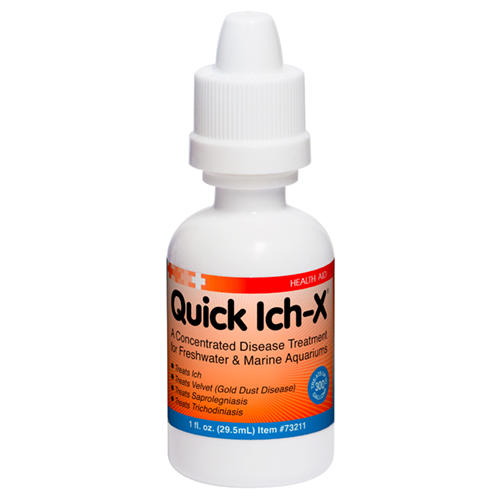 This revolutionary, extremely safe and highly effective product offers you benefits no other metronidazole-based medication can! 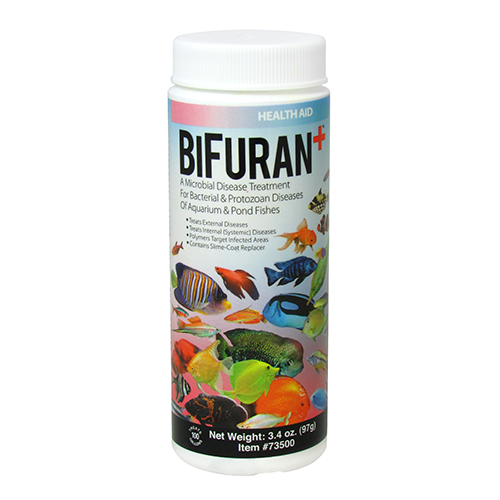 Bath: As a bath treatment use Metro+™ for metronidazole-susceptible, microbial diseases of marine and freshwater aquarium and pond fishes (e.g. hole-in-the-head and lateral line erosion), use 1 capful (~9.7g) per 10 gallons (38L) of water. 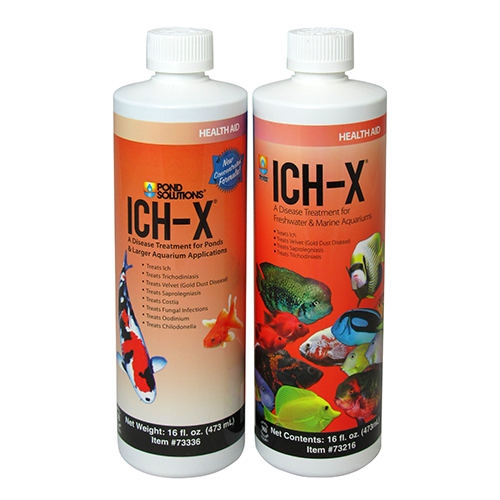 For optimum results, partial or complete water change (using Ultimate® or a combination of Liquid Buffered ClorAm-X® and Stress-X™) must be made prior to the beginning of treatment and every 24 hours for five (5) to seven (7) days consecutively or until mortalities cease or healing of lesions occurs. If improvement is not noted within three (3) days, discontinue treatment and consider other therapy. Oral: For systemic (internal) infections, Metro+ can be fed mixed with fish food or preferably used as part of a prepared food. Check out our article on how to make medicated feed. Please Note: Adding Metro+™ directly to food provides a potentially bitter coating that could keep your fish from partaking readily. 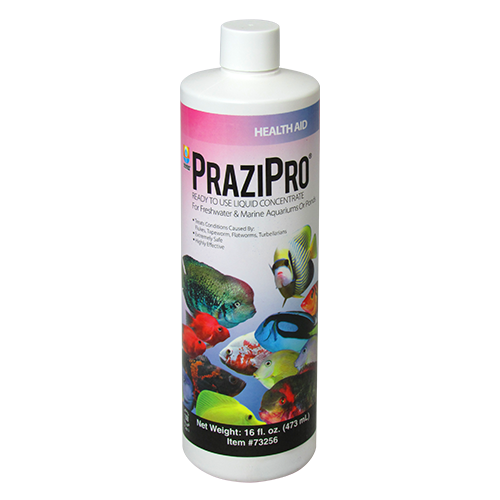 Use Metro+™ for treatment of hole-in-the-head or lateral line disease for freshwater, marine or pond fishes. Metronidazole (2-methyl-5-nitroimidazole-1-ethanol) (Active Ingredient); Sodium Cloride, Synthetic Polymers and a Chelating Agent. CAUTION: Avoid skin and eye contact. Avoid breathing powder or dust. Use in an area with minimal air movement to prevent blowing of powder or dust. In case of contact with eyes, rinse immediately with plenty of water for at least 15 minutes. In case of eye contact immediately flush with water for at least 15 minutes. Get medical attention. In case of skin contact, wash with mild soap and plenty of warm water. 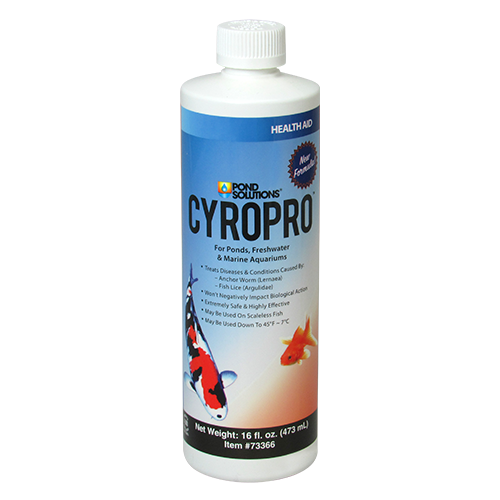 Because We Care: Metro+™ has been developed to offer assistance to aquarium or pond keepers who are encountering problems with metronidazole-susceptible diseases who are looking for a safe and effective treatment.